Researchers now understand that there are three major characteristics of Alzheimer’s disease. Within the brain of an individual with Alzheimer’s, there is an accumulation of amyloid-B protein fragments that clump together and form plaques. Tau proteins in neurons cause the nerve cells to become entangled, and both of these features cause cell damage while interfering with the normal communication between neurons. Scientists from the University of Queensland in Australia, and researchers from Columbia University found a possible means of alleviating one of the problems associated with Alzheimer’s. 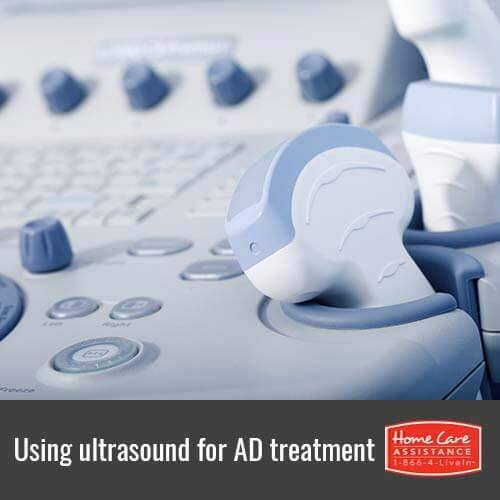 Rhode Island caregivers explain how scanning ultrasound treatment on mice may pave the way for Alzheimer’s research. In Australia, scientists performed tests on laboratory mice that were genetically modified to develop amyloid-B protein clumps. The group introduced the affected mice to high-frequency ultrasound waves on a weekly basis for five consecutive weeks. Imaging of the animal’s brains revealed that the plaques were reduced by 50 percent. The mice also had their memories evaluated throughout the trial by having them navigate a maze. Following ultrasound treatment, the mice demonstrated improved ability to correctly travel through the labyrinth while bypassing a specific section that harbored the consequence of an electric shock. Additionally, the research team from Columbia developed a method of direct medication delivery using microbubbles and ultrasound to loosen the blood-brain barrier. Under normal conditions, the blood-brain barrier acts as a protective wall that prevents certain sizes of molecules from leaving blood vessels and entering the brain. However, when subjected to ultrasound, the barrier weakened and enabled microscopic bubbles packed with medication to pass through and attack the protein plaque formations. The mice used in both experiments did not appear to suffer any damaging effects secondary to the treatments. However, the researchers cautioned that although the findings were promising, the anatomy of human brains is so much more complex than that of mice. While these innovations are a step toward finding a cure, researchers must still overcome the hurdles of neuron damage and the loss of synapse communication. Therefore to manage the symptoms of Alzheimer’s disease, doctors still recommend the current medical treatments and resources like in-home care in Rhode Island. To help your senior loved one manage his or her Alzheimer’s symptoms, take advantage of available Alzheimer’s resources and reach out to Home Care Assistance. We provide comprehensive Alzheimer’s care Rhode Island families can trust and create flexible as-needed schedules to meet your loved one’s needs. In addition to personal care and housekeeping, our highly trained caregivers offer emotional support and companionship to seniors as they learn to adapt to Alzheimer’s disease. Learn more by calling a friendly Care Manager at (401) 284-0979 today.